New and Improved John Moose Deluxe Cap Press with Aluminium Heat Element & Cap Clamping Attachment. This is a John Moose Cap Press. There are many cap press on the market that looks like ours. But if you look closely, you will be able to tell the difference. The obvious difference is the gauge. We designed our gauge to be very easy to use for the user. However, the biggest difference is something that you can not tell from the photo. It is the structure and back pressure post. It is much more robust and durable. We have been in business since 2006. We take our customer's feedback very seriously. We try to incorporate all the recommendations that our customers give us and continuously improve our products. The 2 features that no other Cap Press in this class has. Auto timer and buzzer, no need to push to start timer and push to stop buzzer. Reduce fatigue and save time. Mounting clamp, which hold down the cap that placed on the machine. Precise position of the cap that need to be pressed. Introducing our 4th generation model cap press. Not only it has all the clamping feature of the 3rd generation, we have added: 1. Timer will start as soon as the lever is down. No need to press the start button. Other Cap Presses in this class are with manual timer. Upgraded to more reliable gauge and electronic components. Our 3rd generation cap press was successful and we did not stop. Just to recap, Our 3rd generation cap press was completely redesigned. The digital control box has been relocated on the swing arm from the base to make more room for cap mounting. We are trying to apply for a patent on the cap mounting clamping attachment. This attachment will greatly help on holding the cap firmly on the transfer half dome. What is the benefit for the clamping feature? Cap press base is a domed surface. The cap does not sit on the dome surface firmly. It will move around on the dome surface and the graphics will tends to fall off from the cap. We have done many caps with our older model without the clamping attachment. It is very frustrating and time consuming. Most of the time it requires a 2nd pair of hands. With the clamping feature, the cap will sits firmly on the dome surface giving you the free hands to align the graphics and doing the transfer. It will save you a lot of work and on production time. Another major use of the cap press is for doing spot transfers such as: tag-less label on the back of the T shirt, anywhere on jean and pants, sleeves and backpack. 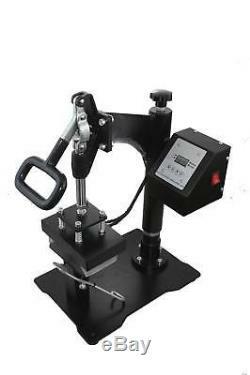 Due to its smaller and domed size, it can get to the hard to reach area that a flat heat press can't do. Almost a must fixture in apparel printing. This cap press is our 4th generation press. We went from a 1G two-gauge cap press to a 2G single gauge dual display cap press to 3G cap clamping cap press to this 4G cap press. In the process, we constantly trying to get better, more well built equipment and keep the pricing low without sacrificing on quality. The color of the cap press may vary from the picture. Spring balance loaded pressure heat platen. ----Auto timer start and stop. ----Extra working room for mounting cap. ----Digital temperature and timer display -----Input Voltage: 110V-120V. ----Plugs into regular wall outlet. Please read all terms before purchasing, by purchasing this product you agree to all terms. An operating instruction/tips and tracking info will be emailed. We welcome visit to our store in Southern California to see the press. It usually takes 21 days to get to your place. Please leave us you contact telephone number. Our press is designed with customer in mind. All components of the press can be removed. On the return, we will. We have many type of heat press. Swing, clamshell, 15x15, 16x20, 16x24, Mug Press, Cap Press, Combo. Transfer paper, ArTainium Sublimation ink and a host of other items. 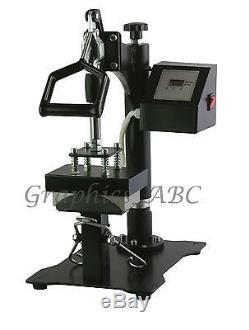 The item "New Model Cap HEAT PRESS with Cap Mounting Clamp Hat" is in sale since Tuesday, August 31, 2010. This item is in the category "Business & Industrial\Printing & Graphic Arts\Screen & Specialty Printing\Heat Transfer\Presses". The seller is "graphics_abc" and is located in Los Angeles, CA. This item can be shipped to United States, Canada.